There are very few American cultural institutions that mean more to black music than the famed Apollo Theater in Harlem, N.Y. From James Brown to a 13-year-old Lauryn Hill, black modern music royals have all lent their talents to the theater's storied legacy. As the theater fights to win a grant that will aid in preserving the historical performance space, which you can help it do by voting to fund it, we look back at rare photos of the stars who graced its stage. Also, check out more Apollo Theater memories here. The Queen of Soul spent a lot of time during her trek to royalty on the Apollo stage. Never one for subtle outfits, Franklin, shown here donning a turquoise boa on the stage in the 1970s, was inducted into the Apollo Legends Hall of Fame in 2010. Michael Jackson was honored posthumously during the same ceremony. Famed bandleader Basie and immortal funnyman Foxx performed at the Apollo on the same night? It must have been one heck of a show. The Apollo helped launch the career of James Brown, whose signature electric performances were a mainstay on the Apollo stage throughout the 1960s. And it was his self-financed Live at the Apollo 1962 album that shot him into superstardom. Extra-cool bluesman King was a fixture at the theater, so much so that he recorded an entire album there. Live at the Apollo earned King a Grammy for best traditional blues album in 1992. Big-haired diva and songstress Khan played the Apollo several times during her career. 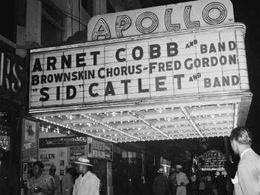 Arnett Cobb, a jazz saxophonist from Houston, and jazz drummer "Sid" Catlett appear on the Apollo's marquee in the '40s. For Knight, the Apollo Theater is more than just a performance venue. It is, according to her, the place that saved her career. "I am grateful to the Apollo for allowing us to have a venue to come to. There were times we couldn't play anywhere else. In this theater, something happened I've not seen done in any theaters during my 63 years in the industry," she told Sister2Sister magazine in 2010. Ever the eccentric showman, Little Richard emerged from a throne flanked by British guards at his appearance at the Apollo in the 1950s. Richard was inducted into the Apollo Legends Hall of Fame in 2006. The theater's stellar reputation for grooming some of the most famous musicians in the world sometimes overshadows its commitment to showcasing talented comedians, who were very much a staple of its trademark Amateur Night. Richard Pryor and other comedians were often booked to perform over the years. Wonder, who first performed at the Apollo in 1962, is pictured here in the 1980s decked out in a white-sequinned suit with some of his famous friends, including Boy George (right). Wonder was inducted into the Apollo Legends Hall of Fame in 2011.